Unfortunately this can allow your ligaments to move too much causing the joints to become increasingly mobile which leads to the pelvis becoming unstable and “grind” together, causing pain and inflammation. The symphysis pubis gap in a non-pregnant woman is 4-5mm, but can move 2-3mm in pregnancy. Symphysis diastasis is when the gap is more than 10mm wide and can be diagnosed by X-ray, MRI or ultrasound. Other risk factors that can increase your chances of getting symphysis pubis dysfunction is women who are hyper-flexible when non pregnant, also women that have over stretched the joint prior to pregnancy i.e. ballet dancer/gymnast’s etc. When it occurs in labour, it is usually because of being in stirrups for a long time. 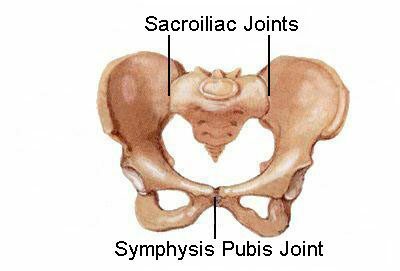 The main symptom of PGP/SPD is pain and this can be anywhere on the pelvic region either at the front with the symphysis pubis or the back along the sacro-iliac joints. Are there any self help tips? It does not stop you having a normal vaginal delivery, but having PGP/SPD will mean that your birth plan will need careful planning with your midwife or consultant, i.e. avoid stirrups if at all possible, giving birth in all fours position or the position that you find most comfortable. Pingback: How often should you have a pregnancy massage?